Continuous production of chemical compounds by microreactor technology has proven to be a major benefit for many applications. In their lab facilities, FutureChemistry optimizes critical parameters of a chemical process and subsequently scales out the reaction for continuous processing. The nitration of aromatic compounds is a key reaction in organic chemistry. Conventionally, this reaction is difficult to control due to its exothermic character and the reagents’ high reactivity. Using undiluted nitration mixture (nitric acid with sulphuric acid) the reaction is very prone to thermal runaway and release of large amounts of nitrous fumes. As a result, this reaction is often performed by paralleling batch reactions. Direct nitration with nitric acid limits batch scale-up, but it is now shown to be possible in continuous flow. The latter has the added advantage of being able to tune reagent feed to minimise oxidative side products, which is a common problem in the nitration of the used model substrate cumene. a) Stock solutions approach, yielding a homogeneous reaction mixture. b) Quenching solution to follow the reaction in time. 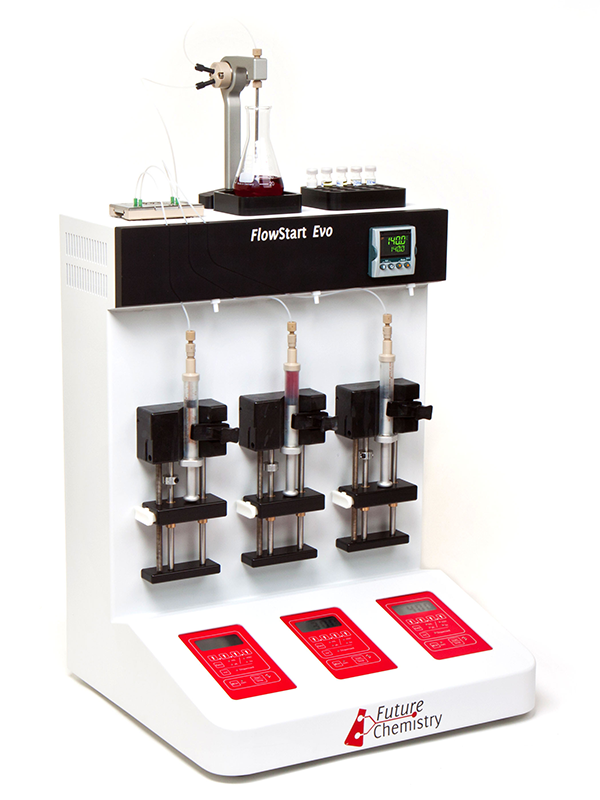 c) Flow markers approach to accurately assess reaction parameters. Log in to the FutureChemistry Portal to download the application notes. The Vilsmeier-Haack formylation of aromatic compounds is a well-established process in organic synthesis, largely driven by the fact that the resulting aldehydes are generally useful intermediates for the synthesis of fine chemicals and pharmaceutical products. Industrial-scale production, however, is often hampered by laborious procedures requiring the use of hazardous chemicals to produce the highly reactive intermediates. In order to circumvent these issues, a flow chemistry approach was developed. It has been demonstrated that the Vilsmeier-Haack formylation can be readily performed in a continuous flow microreactor system. 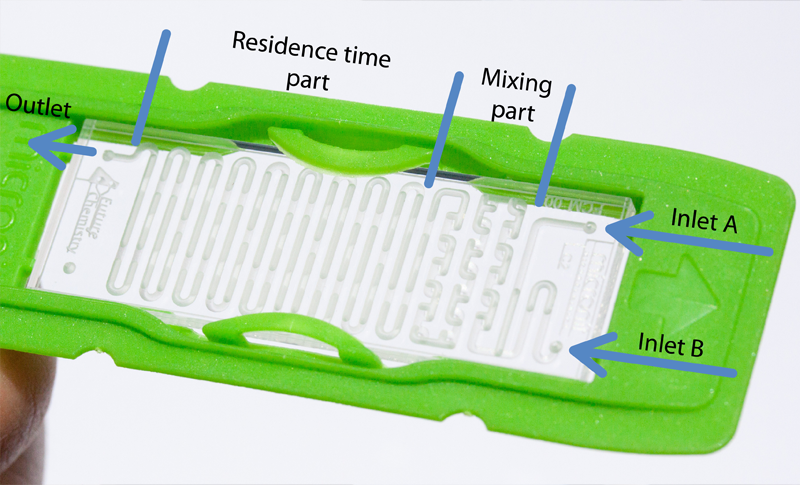 A full optimization study was performed involving reaction time, temperature and molar ratio as process parameters. Under the optimized conditions, scale-up of the reaction has been successfully realized with a continuous production of 2-formylpyrrole of 5.98 g/h. The newly developed process was also shown to be more widely applicable by the successful formylation of several amine-substituted arenes.